UK: UK-produced blades have been delivered to a UK offshore project for the first time as construction activities for Dong Energy's Burbo Bank Extension gather pace. MHI Vestas has delivered the first batch of 80-metre blades for its V164 8MW turbines due to be installed in the Irish Sea at the 258MW project. The turbines have been shipped to the pre-assembly site in Belfast, Northern Ireland. MHI Vestas produces and test the blades at its Isle of Wight facility, currently the only major turbine component factory in the UK. 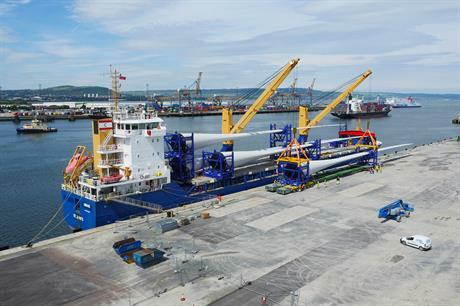 "It's a significant milestone for the industry to see the world's largest blades in serial production arriving in Belfast ready for installation. This marks the first time locally manufactured major components for offshore wind turbines are being used in the UK," MHI Vestas CEO Jens Tommerup said. New UK energy minister, Greg Clark said: "We are committed to our world-leading offshore wind industry and now we have the first ever offshore wind turbine blades built in the UK by MHI Vestas." Offshore installation at Burbo Bank Extension, located 7km off the UK's west coast, is expected to begin over the summer and is due online in early 2017.